Have you ever looked at all those incredible carved pumpkins other people seem to create with ease and wish you could do the same? With our handy guide to expert pumpkin carving you can! Here are our 11 top tips to creating a pumpkin that will be the envy of all your neighbours. You won’t get good results if you don’t choose a quality pumpkin. You’ll want to use a fresh gourd with a strong stem and no bruising. Look for one with a flat bottom. That way it won’t roll all over the place. It might sound strange, but if you cut your lid from the bottom of the pumpkin rather than the top, it’ll help keep your sides strong and stop them caving in. If you really insist on starting at the top, cut your lid out on a slant so that there’s no chance of it falling inside the pumpkin when you put it back on. Scrape out the inner wall of the area you plan on carving so that it’s just over an inch thick. That way it’ll be a lot easier to carve. You can buy special tools to clear out the pumpkin innards, but an ice cream scoop works just as well. Rather than going freeform on your pumpkin, draw your ideas on paper first. That way, you can change it as much as you like before finalising your design. Once you’re ready, tape the paper onto your pumpkin and prick holes along the lines with a pencil or fork so you can recreate your image. Forget about putting your pumpkin on a table. It’s much, much easier to carve your pumpkin when it’s facing up towards you. If you don’t have a specialist pumpkin carving saw, a serrated kitchen knife will do the job just as well. If your design has some large areas you need to clear, roughly cut them out first. You can then go back to tidy and refine the edges afterwards. Don’t just throw away the left-over bits of shell. Get creative with them to make tongues, hair pieces or anything else that will complement your design. If you’re organised enough to prepare your pumpkin a few days before Halloween, you can preserve it by smearing petroleum jelly on the exposed edges to keep moisture in. If you find your pumpkin still shrivels, soaking it in cold water for a few hours will refresh it. 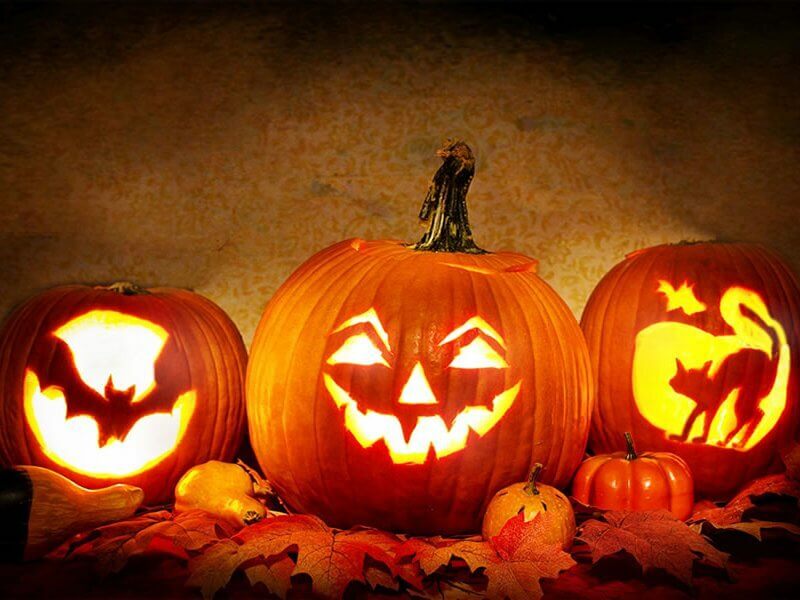 When you first light a candle inside your pumpkin, replace the lid and leave for a few minutes. Then, blow the candle out and carve a small hole where the lid has burnt to give the heat a natural escape route. Alternatively, you can simply use battery powered tealights. For a delicious finishing touch, sprinkle cinnamon over the inside of your lid. As the candle burns, it will release the scent of cinnamon, leaving it smelling sweet for hours.